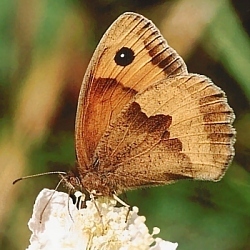 Habitat: The Meadow Brown is one of the most widespread and common species in Ireland and is found in meadows and grassy areas. Hibernation: They do not hibernate. There is considerable variation in colour in the species with the male being darker than the female. Pigment is often lost with age resulting in 'bleaching'. 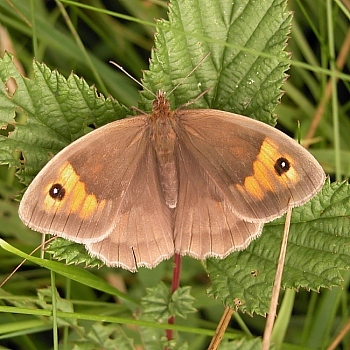 Female Meadow Browns are sometimes mistaken for Gatekeepers. The small newly laid egg is mottled yellowish-brown becoming grey before hatching. It is spherical in shape and flattened top and bottom measuring c.0.5 mm in diameter. The egg is laid singly mainly on blades off grass, often scattered fairly indiscriminately among the food plants. Hatching takes place in c.2 weeks. The egg laying season is long lasting from c.June to September. The adult larva measures up to 28 mm in length, tapering towards the rear. top of the leaves to feed and resting low down. They are rather sedentary and move only short distances. The final instar begins pupation in late May or early June. means of hooks formed by the cast larval skin which remains attached to the pupa. This pupal stage lasts c.4 weeks depending on the temperature. The pupation period lasts from c. late May to early August. After emergence the flight season is long lasting from about late June to late September/October.